Piezosurgery is an osteotomy system used in medical and dental surgery. Manystudies have proven clinical advantages of piezosurgery in terms of quality ofcut, maneuverability, ease of use, and safety. However, few investigations havetested its superiority over the traditional osteotomy systems in terms of dynamicsof bone healing. Therefore, the aim of this study was to evaluate the dynamics ofbone healing after osteotomies with piezosurgery and to compare them with thoseassociated to traditional bone drilling. One hundred and ten rats were divided into two groups with 55 animals each. Theanimals were anesthetized and the tibiae were surgically exposed to create defects2 mm in diameter by using piezosurgery (Piezo group) and conventionaldrilling (Drill group). Animals were sacrificed at 3, 7, 14, 30 and 60 dayspost-surgery. Bone samples were collected and processed for histological,histomorphometrical, immunohistochemical, and molecular analysis. The histologicalanalysis was performed at all time points (n = 8) whereas thehistomorphometrical analysis was performed at 7, 14, 30 and 60 dayspost-surgery (n = 8). The immunolabeling was performed to detectVascular Endothelial Growth Factor (VEGF), Caspase-3 (CAS-3), Osteoprotegerin(OPG), Receptor Activator of Nuclear Factor kappa-B Ligand (RANKL), andOsteocalcin (OC) at 3, 7, and 14 days (n = 3). For the molecularanalysis, animals were sacrificed at 3, 7 and 14 days, total RNA wascollected, and quantification of the expression of 21 genes related to BMPsignaling, Wnt signaling, inflammation, osteogenenic and apoptotic pathways wasperformed by qRT-PCR (n = 5). Histologically and histomorphometrically, bone healing was similar in both groupswith the exception of a slightly higher amount of newly formed bone observed at30 days after piezosurgery (p < 0.05). Immunohistochemical andqRT-PCR analyses didn’t detect significant differences in expression of allthe proteins and most of the genes tested. Based on the results of our study we conclude that in a rat tibial bone defectmodel the bone healing dynamics after piezosurgery are comparable to thoseobserved with conventional drilling. A piezocirurgia é um sistema de osteotomia utilizado em cirurgiasmédicas e odontológicas. Muitos estudos clínicos têmcomprovado as vantagens da piezocirurgia em termos de qualidade de corte,manuseabilidade, facilidade de uso e segurança. Entretanto, poucosinvestigadores tem testado sua superioridade sobre os sistemas tradicionais deosteotomia em termos de dinâmicas de cicatrização óssea.Desta forma, o objetivo deste estudo foi avaliar as dinâmicas de reparoósseo após osteotomias relizadas com cirurgia piezoelétrica ecompará-las com a fresagem óssea tradicional. Cento e dez ratos foram divididos em dois grupos com 55 animais cada. Osanimais foram anestesiados e as tíbias foram cirurgicamente expostas paracriar um defeito de 2 milímetros de diâmetro utilizando cirurgiapiezoelétrica (Grupo Piezo) e fresas convencionais (Grupo Fresa). Osanimais foram sacrificados aos 3, 7, 14, 30 e 60 dias após a cirurgia.Amostras de osso foram coletadas e processadas para análiseshistomorfométrica, imunoistoquimica e molecular. A análisehistomorfométrica foi executada em todos os períodos deavaliação (n = 8). Imunomarcação foi realizadapara detecção de VEGF, CAS-3, OPG, RANKL and OC aos 3, 7 e 14 dias(n = 3). Para a análise molecular os animais foramsacrificados aos 3, 7 e 14 dias, RNA total foi coletado e procedeu-se àquantificação da expressão de 21 genes relacionados à viade sinalização BMP, via de sinalização Wnt, viasinflamatórias, osteogênicas e apoptóticas por meio de qRT-PCR(n = 5). Histológica e histomorfometricamente a cicatrização ósseafoi similar em ambos os grupos à exceção de umaneoformação óssea discretamente maior observada aos 30 dias nogrupo piezo (p < 0.05). As análises imunoistoquímica epor qRT-PCR não detectaram diferenças significantes entre todas asproteínas e genes testados. Baseado nos resultados de nosso estudo nós concluímos que em ummodelo de tíbia de rato a dinâmica de cicatrizaçãoóssea após piezocirurgia é comparável àquela observadacom fresas convencionais. Hard tissue cutting is a common procedure in the medical and dental fields, especiallyduring orthopaedic, maxillofacial, and periodontal surgeries. Traditionally, rotatinginstruments such as burs have been used for osseous surgery. However, disadvantages arerelated to the use of these traditional systems, including bone overheating and damageto adjacent tissues [1, 2]. Piezosurgery has been introduced as a valuable alternative to avoiddisadvantages associated to the traditional rotating instruments. Piezosurgery is performed by means of a device that uses microvibration at a frequencycapable of cutting bone. Its mechanism of action is based on the ability of certainceramics and crystals to deform when an electric current is passed across them,resulting in microvibration at ultrasonic frequency [3, 4]. The vibration is then applied to a nitride-hardened or diamond-coated insertwhich moves at 25 – 30 KHz, a frequency that allows for selective cut of bonetissue . Since its approval for commercial use in 2002, piezosurgery has beensuccessfully utilized for many surgical procedures, such as maxillary sinus lifting , autologous bone graft harvesting , bone splitting , lateralization of the inferior alveolar nerve , and orthognathic and neurologic surgeries [5, 10, 11]. Clinical and pre-clinical studies combined with in vitro studies have shownthat piezosurgery produces clean and precise osteotomies with smooth walls and decreasedbleeding [12, 13]. Maurer at al. evaluated the micromorphological differences after using three osteotomytechniques and observed that different from rotatory drilling and saw, ultrasonicpiezoelectric osteotomy preserved the original structure of the bone. Few works however have studied the process of bone healing after piezosurgery andcompared it to the bone healing that follows after osteotomy by traditional methods. Apurely histological description was provided by Horton et al. . These investigators described accelerated bone formation in alveolar defectsgenerated by chisel and ultrasonic instrument in comparison to traditional drill. Later,Vercellotti et al. evaluated the level of the alveolar bone crest after ostectomy withpiezosurgery and burs in alveolar ridges of dogs. Histological analysis showed a bonelevel gain in the group treated with piezosurgery and bone loss in the diamond andcarbide bur groups. A recent histomorphometrical study conducted by Ma et al. compared the bone healing after osteotomies performed by piezosurgery versusosteotomies performed with oscillatory saws. They found no statistically significantdifferences in terms of histomorphometry. However, the authors found a higher degree offormation of vascularized tissues, of provisional matrix, and of bone remodelingactivity at 7 and 14 days after use of piezoelectric surgery. The only invivo study that combined histomorphometrical and molecular analysis wasconducted by Preti et al. . This group of investigators evaluated the level of osseointegration oftitanium implants placed in surgical bed prepared with piezosurgery versus conventionaldrilling in tibiae of minipigs. 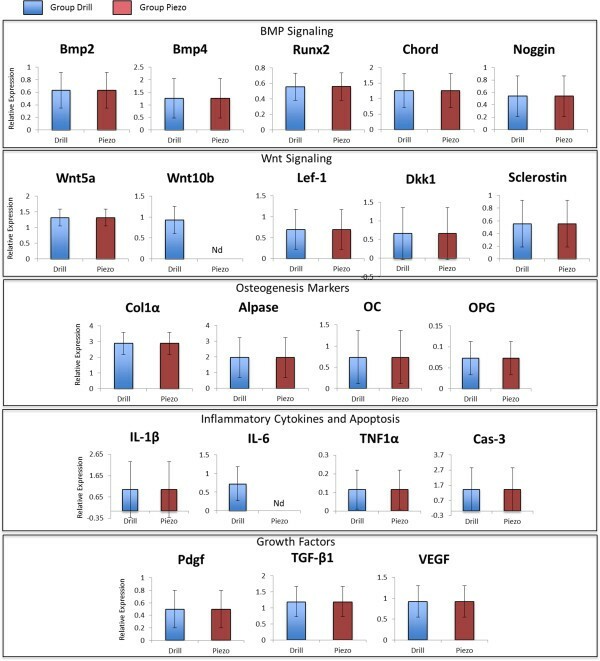 They observed lower number of inflammatory cells, highernumber of osteoblasts, increased expression of BMP-4 and TGF- β2, and lowerexpression of proinflammatory cytokines TNF-α, IL-1β and IL-10 in thepiezosurgery group at 7 and 14 days after osteotomy. Despite the extensive clinical use and proven efficacy of piezosurgery as an osteotomysystem, the data presented in the literature to date does not provide a conclusiveanswer on whether piezosurgery presents with clear advantage over the traditionalosteotomy systems with respect to bone healing acceleration. Data by Preti et al. indicate that piezosurgery may accelerate the earlier phases of the implantosseointegration when compared to traditional drilling; however, a comprehensive studythat evaluates and compares the bone healing process of a bone defect created withpiezosurgery or other traditional systems is still missing. Thus, the aim of this studywas to evaluate the dynamics of bone healing after piezosurgical and drilling osteotomyin bone defects. 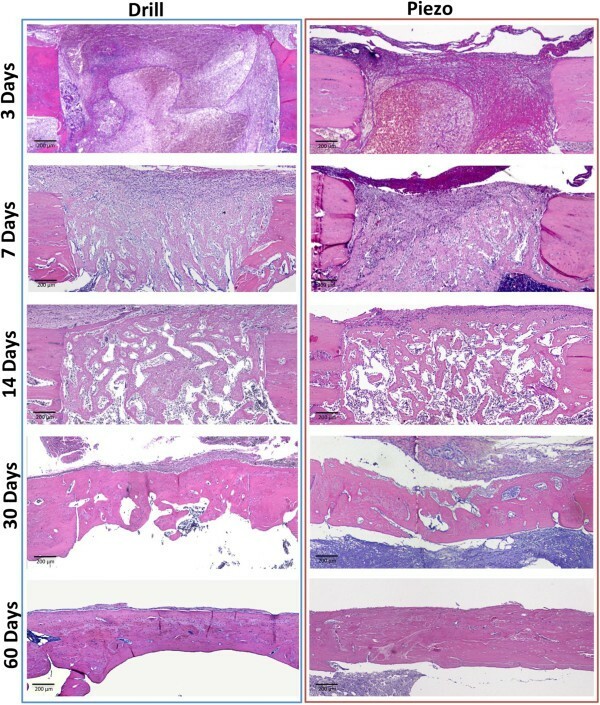 Our study hypothesized that bone healing after piezoelectric osteotomyis faster due to early enhanced expression of growth factors in comparison toconventional drilling. In order to test this hypothesis, the healing process of asubcritical bone defect was analyzed by histology and histomorphometry,immunohistochemistry (IHC), and genetic expression analysis of osteoblastdifferentiation regulators, osteogenic markers, inflammatory cytokines, and apoptoticfactors. Our multifactorial analysis shows no significant differences in speed andquantity of bone regeneration when comparing piezosurgery over traditional drilling. Ethical board approval was obtained for this study by the Ethics in Animal ResearchCommittee of the School of Dentistry of Araraquara (UNESP, Brazil CEEA/FOAr 15/2010).One hundred and ten 3-month-old rats (Rattus norvegicus albinus, Holtzman)were used in this study. The rats were kept at a temperature of 22°C, in a12 h light/dark cycle, with water and food ad libidum. 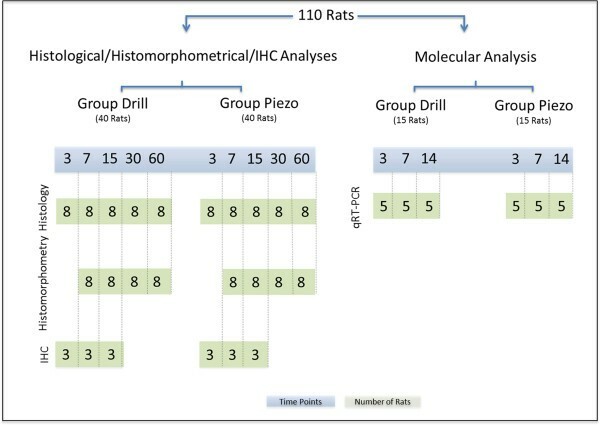 After a 15-dayacclimatization period, the animals were randomly assigned to the two experimentalgroups: Group I (Drill) and Group II (Piezo) with 55 rats each (Figure 1). Study design. Different time points (days after surgery) are illustratedin blue and number of animals per group (n) are illustrated in green. All the animals were submitted to the same surgical procedure under generalanesthesia with a combination of xylazine (0.04 ml/100 g bodyweight)(Francotar, Virbac do Brazil Ind. Com. Ltda., São Paulo, Brazil) andketamine (0.08 ml/g body weight)(Vyrbaxil, Virbac do Brazil Ind. Com. Ltda.,São Paulo, Brazil). Preoperative trichotomy of the inner region of the leg wasperformed and povidone iodine solution was applied to the surgical site to preventpossible sepsis. Next, an incision of approximately 20 mm in length wasperformed at the medial side of the right tibia, by the proximal metaphysis. Bonetissue was carefully exposed and a monocortical subcritical osteotomy of 2 mm indiameter was performed. For Group I, 2 mm in diameter drills were used to createthe bone defect. For Group II a piezosurgery device – Piezo Master Surgery(EMS®, Nyon, Switzerland) - was set for cortical bone osteotomy(“surgical” mode, maximal cutting efficiency and 50% of sterile salineflow rate) and a 2 mm round diamond-coated tip was used to create the defect.External irrigation with sterile saline solution was provided in both groups. Tofacilitate the subsequent tissue processing, radio-opaque gutta-percha pins werepositioned at a distance of 2 mm from the osteotomy edges. Soft tissue wassutured with 4–0 nylon (Ethicon, Division of Johnson & Johnson MedicalLimited, São Jose dos Campos, São Paulo, Brazil). All the procedures wereperformed by the same surgeon, previously trained. After surgery, animals received anintramuscular dose of penicillin and streptomycin (0.1 ml/Kg of body weight)(Pentabiotic Pequeno Porte, Fort Dodges, Campinas, São Paulo, Brazil) and agavage of acetaminophen (15 mg/Kg of body weight) (Paracetamol-Medley®,Campinas, Brazil). For histological, histomorphometric, and immunohistochemical (IHC) analysis tissueswere collected at 3, 7, 14, 30 and 60 days post surgery (Figure 1, Histological/Histomorphometrical/IHC Analyses). Morespecifically, histology was performed on samples collected at 3, 7, 14, 30 and60 days post surgery (n = 8) and histomorphometry was performed onsamples collected at 7, 14, 30 and 60 days post surgery (n = 8).Immunohistochemical analysis was performed on tissues collected at 3, 7, and14 days post surgery (n = 3). Block biopsies were harvested bycollecting the treated area along with an additional 2 mm of surrounding tissuemarked by the gutta-percha. Upon collection, tissue was fixed in 4% paraformaldehydefor 48 hours. The samples were then decalcified in EDTA buffered at pH 7.2with 0.1 M sodium phosphate, embedded in paraffin, and cut into 4 μmsections along the longitudinal axes. For quantitative RT-PCR analysis, 5 animals pergroup were sacrificed at 3, 7 and 14 days after surgery (Figure 1, Molecular Analysis). Bone blocks were harvested by collectingthe treated area along with the additional 2 mm of surrounding tissue marked bythe guttaperca. The bone blocks were quickly rinsed once in PBS and immediatelypreserved in RNA Later (Sigma-Aldrich Inc. Brasil) until quantitative RT-PCR wasperformed. The two most central histological sections of each bone defect were stained withhematoxylin and eosin for histomorphometric analysis. Standardized pictures wereobtained with a digital camera (DSC295m, Leica Maicrosystems, Wetzlar Hessen,Germany) mounted on a microscope (Leica DM 2500, Leica Maicrosystems, Wetzlar Hessen,Germany). Images were analyzed using the Image J image analysis software  to quantify the bone neoformation. Analyses were repeated three differenttimes at intervals of 1 week by the same blinded operator. Measurements wereperformed as follows: the total area (TA) to be analyzed was identified by delimitingthe bone defect (2 mm in diamater) at 2 mm from the guttaperca referencepoints and the newly formed bone area (NFBA or bone neoformation) was then delineatedwithin the TA. The percentage of NFBA was calculated according to the followingformula: 100×NFBA(pixels)/TA(pixels) and values were submitted to statisticanalysis using analysis of variance (ANOVA) followed by a post hoc Tukey’s testwhen the ANOVA suggested a significant difference among groups(p < 0.05). Immunohistochemical staining for Vascular Endothelial Growth Factor (VEGF), Caspase-3(CAS-3), Osteoprotegerin (OPG), Receptor Activator of Nuclear Factor kappa-B Ligand(RANKL), and Osteocalcin (OC) was performed on 4-μm sections mounted onsilanized slides (DAKO A/S, Golstrup, Denmark). Antigen retrieval for VEGF and CAS-3detection was performed by incubation with 10 mM sodium citrate buffer,pH 6.0 at 70–75°C in a vapor cooker, for 30 min. Antigenretrival for OC, OPG and RANKL was performed by incubation with 0.5% trypsin for20 minutes at 37°C. All sections were treated with 3% hydrogen peroxidasein methanol for 30 minutes to block endogenous peroxidase activity. Afterward,sections were incubated with 3% bovine serum albumin in phosphate buffered saline(PBS) (Sigma-Aldrich, St. Louis, MO) for 30 minutes at room temperature to blocknonspecific protein binding. Subsequenlty, slides were incubated overnight withprimary antibodies specific for CAS-3 (Rabbit polyclonal antibody – Abcam, Inc.USA, cat # ab44976, dilution 1:400), VEGF (Rabbit polyclonal antibody – Abcam,Inc. USA, cat # ab46154, dilution 1:400), OPG (Rabbit polyclonal antibody –Abcam, Inc. USA, cat # ab73400, dilution 1:300), RANKL (Mouse polyclonal antibody– Santa Cruz Biotechnology Inc., USA, cat # sc-7628, dilution 1:200), and OC(Mouse monoclonal antibody – Abcam, Inc. USA, cat # ab13420, dilution 1:200).For negative controls, the immunohistochemistry was performed by replacing theincubation step with primary antibodies with an incubation step with non-immuneserum. Then, sections were incubated with biotinylated immunoglobulins (avidin-biotincomplex, Universal LSAB 2 Kit/HRP kit, DAKO Inc., USA), and the reaction product wasdetected with an Avidin Biotin Peroxidase complex (ABC kit, DAKO Inc., USA) andstained with the chromogen substrate diaminobenzidine (LiquidDAB + Substrate Chromogen system, DAKO Inc., USA). Sections werecounterstained with hematoxylin and examined by a calibrated examiner under lightmicroscopy at x25 and x100 final magnifications. The quantification of the proteinexpression was performed by an ordinal qualitative analysis, following a previouslypublished methodology [2, 20]. Briefly, staining scores were categorized as follows: negative (−),positive (+), superpositive (++), and hyperpositive labels (+++). To perform aquantitative comparison, scores were then converted into percentile averages asfollows: 0% (equivalent to “-“, negative staining), 20% (equivalent to“+”, 10% to 30% total staining), 60% (equivalent to “++”, 50%to 70% total staining), and 90% (equivalent to “+++”, 80% to 100% totalstaining). Percentile averages of each protein were submitted to statistical analysisusing the non-parametric Mann–Whitney test, comparing the Drill group and thePiezo group at each time point. Significant difference between the groups was definedby p values < 0.05. Expression analyses of VEGF, RANKL, OPG, and OCwere performed within the margins of the created defect. Expression analysis ofCaspase-3 also included the scoring of bone areas surrounding the margins of thedefect (2 mm). Total RNA was extracted from bone samples using a Trizol reagent (Life TechnologiesInc, USA) according to the manufacturer’s protocol. Complementary DNA wassynthesized by reverse transcription of 1 μg of total RNA using oligo (dT)as primers (High Capacity cDNA synthesis kit, Applied Biosystems, Warrington, UK).Real-time quantitative PCR was conducted under standard enzyme and cycling conditionson a StepOne system (Life Technologies Inc, USA), using custom-designed real-timeassays (Universal Probe Library - Roche, Indianapois, USA). According to themanufacturer’s instructions, reactions were performed in 10 μLtriplicates for each target cDNA. Data was analyzed using a comparativeΔΔCt method . Twentyone genes, divided into 5 categories were tested: 1) BMP Signaling:Bone Morphogenetic Protein 2 (Bmp2 – NM_017178.1), Bone MorphogeneticProtein 4 (Bmp4 – NM_012827.2), Runt related transcription factor 2(Runx2 – NM_053470.2), Noggin (Noggin NM_012990.1),Chordin (Chordin - NM_057134.1); 2) Wnt Signaling: Wingless-related MMTVintegration site 5A (Wnt5a – NM_022631.1), Wingless-related MMTVintegration site 10B (Wnt10b – NM_01108111.1), Lymphoid enhancerbinding factor 1 (Lef-1 – NM_NM_130429.1), Sclerostin(Sclerostin - NM_030584.1), Dickkopf Wnt signaling pathway inhibitor(Dkk1 – NM_001106350.1); 3) Osteogenisis Markers: Collagen type 1alpha (Col1α – NM_053304.1), Osteocalcin (Oc –NM_013414.1), Alkaline Phosphatase (Alpl – NM_013059.1),Osteoprotegerin (Opg – NM_U94330.1); 4) Inflammatory Cytokines andApoptosis: Interleukin 1β (IL-1β – NM_031512.2), Interleukin6 (IL-6 – NM_012589.1), Tumor Necrosis Factor alpha(Tnf-1α – NM_012675.3), Caspase 3 (Cas-3 –NM_012922.2); 5) Growth Factors: Platelet-derived growth factor (Pdgf– NM_031524.1), Transforming growth factor beta 1 (Tgf-β1 –NM_021578.2) and Vascular endothelial growth factor (Vegf –NM_001110333.1). Gene expression levels were normalized to the housekeeping geneβ-actin (NM_031144.2). At each time point (3 days, 7 days,and 14 days after surgery) values for each gene in the Piezo group werecalculated as relative expression compared to the Drill group. Statistical analysiswas performed using Student’s t-test and significant differencebetween the groups was defined by p values < 0.05. All subcritical bone defects in both groups healed with full regeneration of bone.The histological and histomorphometrical characteristics of the healing stages werevery similar between the groups (Figures 2 and 3 respectively). Three days post surgery, the bone defects createdby either drilling or piezosuregry showed regular shapes and well defined edges. Inboth cases, blood clot and inflammatory cells occupied the whole area of the defectand no bone neoformation was observed at this time. By day 7, the blood clot wasprogressively replaced by a connective tissue exhibiting a high cell density. Osteoidtissue was also present within the defect and bone neoformation was not statisticallysignificant between the two groups at this time point. At 14 days post surgerythe defects of both groups were mainly filled by newly formed woven bone with thinand irregular trabeculae surrounded by fibro-vascular tissue. At 30 days postsurgery the piezosurgery osteotomies and drilling osteotomies were completely bridgedby mineralized bone with irregular shape and volume. At this point, the amount ofbone was significantly higher in the piezo group (p < 0.05,73.88% ± 12.08 versus 57.81% ± 12.00). However,this difference disappeared at 60 days after surgery, when a mature strip oflamellar bone reconstituted completely the entire cortical thickness of the tibiae inboth groups with no differences in terms of quantity and quality. Histological evaluation of the healing process over time. Lightmicrographs obtained at 3, 7, 14, 30, and 60 days after surgery. Healingprocess after drilling (Drill group, left) and after piezosuregry (Piezo group,right). Hematoxylin and eosin staining. Histomorphometrical analysis of the healing process over time.Percentage of bone neoformation measured within the bone defects generated bydrilling (Drill) or piezosuregry (Piezo). * indcates statistically significantdifference between the Drill and Piezo group (p < 0.05,n = 8). The expression of VEGF and CAS-3, two early stage markers of bone healing [22, 23], was similar between the Drill and Piezo groups at 3, 7, and 14 daysafter surgery (Figures 4 and 5). Theexpression of OPG, RANKL and OC, three late stage markers of bone healing, wasanalyzed at 7 and 14 days after surgery (Figures 5and 6). At both time points, no significant differences weredetected for each gene between the two groups. Immonohistochemical analysis of early healing markers during the boneregeneration process. Percentile ranks of immunolabeling for Vascularendothelial growth factor (VEGF) and Caspase-3 (CAS-3) at 3, 7, and14 days after surgery, in bone defects generated by drilling (Drill) orpiezosuregry (Piezo). No statistically significant differences were foundacross all time points (n = 3). Immunolabeling of early healing and bone remodeling markers. Left:Immunolabeling of Vascular endothelial growth factor (VEGF) and Caspase-3(CAS-3) of tissue sections obtained at 3, 7, and 14 days after drilling(Drill) or piezosuregry (Piezo). Right: Immunolabeling of Osteoprotegerin(OPG), Receptor activator of nuclear factor kappa-B ligand (RANKL), andOsteocalcin (OC) of tissue sections obtained at 7 and 14 days afterdrilling (Drill) or piezosuregry (Piezo). Sections were stained with thechromogen substrate diaminobenzidine and counterstained with hematoxylin.Staining scores were categorized as negative, positive (brown-yellow color),superpositive (brown color), and hyperpositive (intense brown color) (seeMethods). Left (VEGF and CAS-3): at 3 days, only a few posivite regions inbrown-yellow color are observed in both groups. Hyperpositive immunolabeling(intense brown color) is visible only at 7 days. At 14 days, theexpression of VEGF and CAS-3 tended to be positive (brown-yellow) andsuperpositive (brown color). Right (OPG, RANKL and OC): at 7 days,hyperpositive immunostaining (intense brown color) is observed for OPG and OC,whereas superpositive immunoreaction (brown color) was detected for RANKL. At14 days postsurgery, superpositive labeling (brown color) is observed forall three markers. In the negative controls no immunopositivity was detected atall times. Immonohistochemical analysis of bone remodeling markers during the boneregeneration process. Percentile ranks of immunolabeling forOsteoprotegerin (OPG), Receptor activator of nuclear factor kappa-B ligand(RANKL), and Osteocalcin (OC) at 7 and 14 days after surgery, in bonedefects generated by drilling (Drill) or piezosuregry (Piezo). No statisticallysignificant differences were found across all time points(n = 3). Quantitative RT-PCR analysis was performed at 3, 7, and 14 days after surgery(Figures 7, 8, and 9 respectively) to evaluate expression of genes of the BMP and Wntpathways and expression of genes that mark osteogenesis, inflammation, and apoptosis.Gene expression analysis of growth factors such Pdgf, Tgf-β1,and Vegf, which have also been shown to be involved with the bone healingprocess was also performed. Gene expression analysis at 3 days after surgery. Comparative geneexpression analysis between drilling (Drill) and piezosurgey (Piezo) of 21genes involved with BMP signaling, Wnt signaling, inflammation, apoptosis andosteogenenis 3 days after surgery. * indicates statistically significantdifference (p < 0.05), Nd (not detectable) indicates lack ofdetectable expression (n = 5). Gene expression analysis at 7 days after surgery. Comparative geneexpression analysis between drilling (Drill) and piezosurgey (Piezo) of 21genes involved with BMP signaling, Wnt signaling, inflammation, apoptosis andosteogenenis 7 days after surgery. * indicates statistically significantdifference (p < 0.05), Nd (not detectable) indicates lack ofdetectable expression (n = 5). Gene expression analysis at 14 days after surgery. 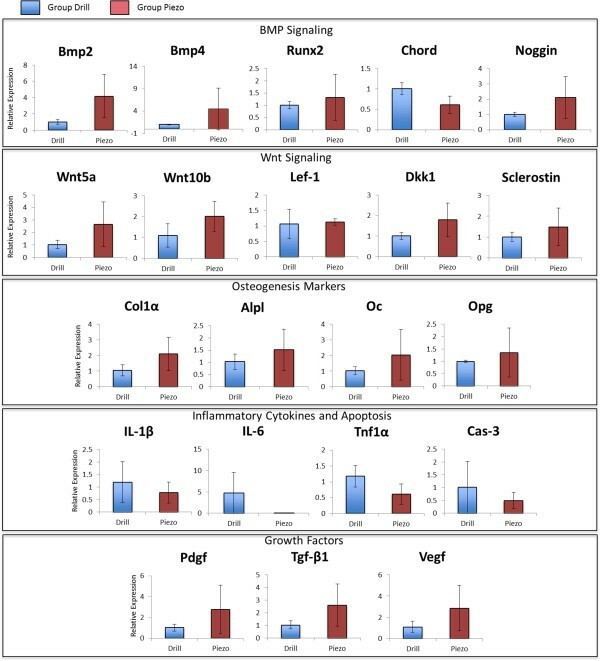 Comparative geneexpression analysis between drilling (Drill) and piezosurgey (Piezo) of 21genes involved with BMP signaling, Wnt signaling, inflammation, apoptosis andosteogenenis 14 days after surgery. * indicates statistically significantdifference (p < 0.05), Nd (not detectable) indicates lack ofdetectable expression (n = 5). At three days after surgery (Figure 7), during the initialinflamamtory phase of healing when the bone defects are filled by inflammatory tissue(see Figure 2), the pattern of genetic expression wassimilar between the Drill and the Piezo group, with no statistically significantdifferences between the two groups for all the genes tested. By 7 days (Figure 8), when bone formation is activelyoccurring and part of the defect is filled by newly regenerated bone (seeFigure 2), Runx2 (BMP signaling),Wnt10b and Sclerostin (Wnt signaling), and Cas-3(apoptosis) were differentially expressed, with no detectable levels of expression orstatistically significant lower levels of expression in the Piezo group versus theDrill group (p < 0.05). At 14 days (Figure 9), when the bone defects arefilled with bone and highly vascularized fibro-fatty bone marrow (seeFigure 2), Wnt10b (BMP signaling) andIL-6 (inflammation) were differentially expressed, with no detectablelevels of expression in the Piezo group. The aim of this study was to evaluate the dynamics of bone healing after piezosurgicaland drilling osteotomy. 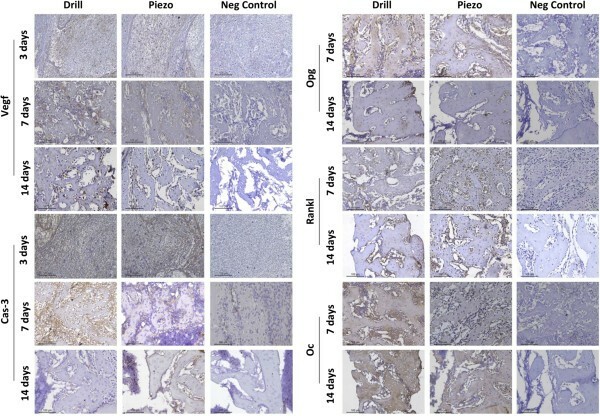 Our study hypothesized that when compared to conventionaldrilling, bone healing after piezosurgery is faster due to enhanced expression ofproteins involved in bone regeneration and reduced expression of proteins involved ininflammation and apoptosis. To test our hypothesis we chose to study the bone healing process of a subcritical boneosteotomy since subcritical bone defects spontaneously and consistently heal by completeregeneration of the missing bone as their bone regenerative potentials are always fullyexploited . The only variables that can influence their healing process are the level ofinflammation that occurs immediately after the creation of the defect and the speed bywhich the regeneration process may occur. By means of this strategy, in a rat model oftibial subcritical size bone defect we therefore were able to follow and compare theevents associated with the regeneration of bone defects created by drilling (Drillgroup) or piezosurgery (Piezo group). We analyzed the bone formation by means of histology and histomorphometry at severaltime points, going from the early inflammatory stage (3 days after surgery) to thelatest time point when complete bone regeneration and remodeling has occurred(60 days after surgery). By means of immunohistochemistry we also analyzed proteinexpression of early bone healing markers such as VEGF and CAS-3 at the early stages ofthe regenerative process (starting from day 3 up to day 14) and protein expression ofbone remodeling markers such as OPG, RANKL, and OC at 7 and 14 days, when maximalregenerative activity occurs. Gene expression analysis of 21 genes expressing osteoblastdifferentiation regulators, osteogenic markers, inflammatory cytokines, and apoptoticfactors was performed at 3, 7, and 14 days after surgery to validate andsubstantiate the immunohistochemical analysis. Among the osteoblast differentiationregulators, we tested several genes representative of the BMP canonical pathway  and of the Wnt canonical and non-canonical pathways  because of their relevance with the cellular activity that occurs during boneregeneration. Not all genes tested were consistently expressed throughout the healingprocess. We chose to utilize and show data regarding those genes that consistentlypresented with reproducible results. The data collected showed that in our animal model the bone healing dynamics afterpiezosurgery are comparable to those observed with conventional drilling, with noevident signs of bone healing acceleration in the Piezo group versus the Drill group. Atall the time points analyzed, histological analysis showed no differences between thedefects created by piezosurgery and drilling. Histomorphometrical analysis also showedno differences’, with the exception of higher levels of newly regenerated bone at30 days after piezosurgery. However, this difference disappeared at 60 days,when the amount of newly regenerated bone was equal for both groups. This result couldbe indicative of a better ability to regenerate bone of the Piezo group at 30 daysof healing. However, our subsequent analyses indicate that this temporarily higheramount of bone formation is not due to healing acceleration during the early stages ofhealing. In fact, immunohistochemical analysis at 3 days after surgery showed nostatistically significant difference in terms of expression of both VEGF and CAS-3 andgene expression analysis of 21 different genes, including Vegf andCas-3, showed no significant differences for all the genes analyzed. Also,seven days after surgery, immunohistochemistry showed no differences in expression ofVEGF, CAS-3, OPG, RANKL, and OC, indicating no changes during early healing in terms ofvascularization, apoptosis, and bone regeneration and remodeling. The gene expressionanalysis at 7 days also showed no difference in expression of Vegf,Cas-3, Opg, and Oc. However, a significant reduction inexpression of Runx2, Wnt10b, and Sclerostin was detected inthe Piezo group at this time point. 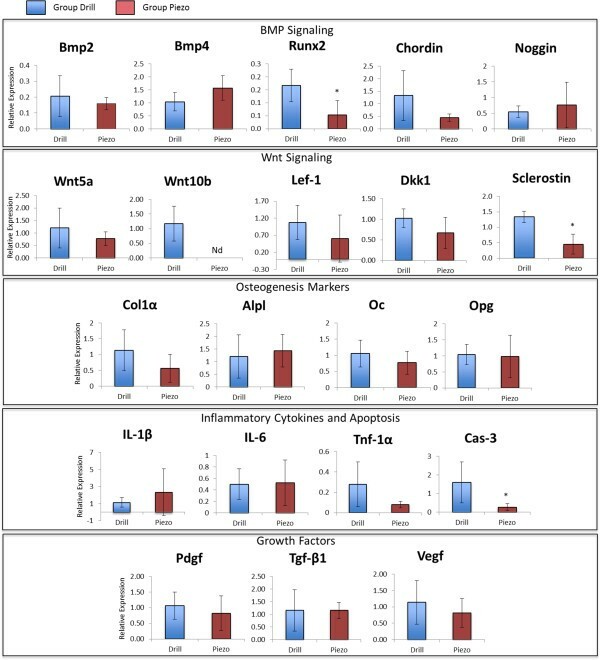 Since activation of BMP and Wnt signaling have beendemonstrated to be essential at the early stages of bone repair [25, 26], this data may indicate a reduction in terms of number of osteoprogenitorcells (reduction of Runx2) as well as a lower level of Wnt activity (lack ofdetection of Wnt10b indicating a direct down-regulation of the canonical Wntpathway and reduction of expression of Sclerostin indicating the unnecessaryexpression of an inhibitor because of the already occurred down-regulation of thepathway) that may be interpreted as a deceleration rather than an acceleration of thehealing process in the Piezo group. Furthermore, at 14 days after surgery, theimmunoreaction also showed no significant differences between the two groups and geneexpression analysis also showed no differences in expression of Vegf,Cas-3, Opg, and Oc. However, a significant reduction (lackof detection) of expression of Wnt10b and IL-6 in the Piezo group wasdetected at this time point. Thus, data collected at each time point may be indicativeof a deceleration rather than acceleration of the healing process associated topiezosurgery. It could be speculated, however, that the decreased levels of expression ofRunx2 and Wnt10b seen at 7 and 14 days in the Piezo group areindicative of a diminished need for a full-speed regenerative process at these timepoints because in this group healing has already progressed to later and more advancedstages. However, considering that the histomorphometrical and immunohistochemicalanalyses did not show any difference in terms of amount and quality of bone regenerationat all early time points tested, we believe that this is not necessarily the case andthat the gene expression changes observed in the Piezo group may simply represent normalvariability of a complex process that is not regulated by few genes only. Our data is not in contrast with the results shown by previous studies that comparedpiezosurgery with other traditional osteotomy methods. For instance, a study by Ma etal. found no statistically significant differences in terms of histomorphometrybut higher degree of formation of vascularized tissues, of provisional matrix, and ofbone remodeling activity at 7 and 14 days after piezosurgery. These results mayappear different from those shown in the present study. However, the animal modelutilized by Ma and coworkers used bone defects smaller than those used in the presentstudy and therefore the difference between the two studies may be due to the size of thebone defects utilized. 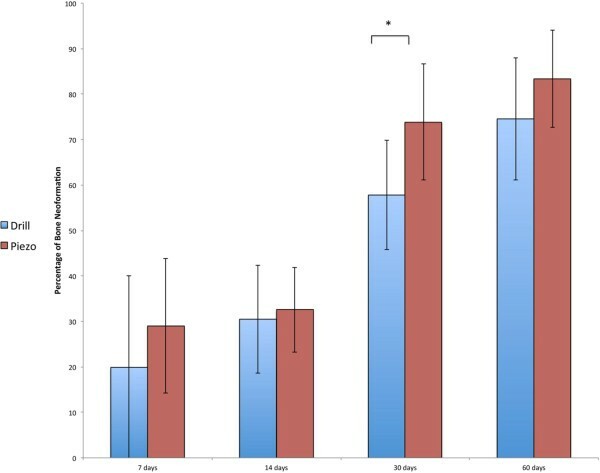 Preti and co-workers  concluded that piezoelectric surgery appears to be more efficient in thefirst phases of bone healing than traditional osteotomy. Once again, these results mayappear in contrast to those presented in this work. However, in their study Preti andco-workers analyzed the effects of piezosurgery on osseointegration of implants and noton regeneration of bigger bone defects. It is possible that the different conclusionsare due to the different microenvironments studied. Similar consideration may be madebetween the bone defect microenvironment analyzed in our study and the periodontaldefect microenvironment analyzed by Vercellotti et al. . Thus, it remains possible that piezosurgery accelerates osseointegration oftitanium implants and facilitates periodontal regeneration without being advantageous interms of regeneration of bigger bone defects. Based on the results of our study we conclude that in a rat tibial subcritical bonedefect model the bone healing dynamics after piezosurgery are comparable to thoseobserved with conventional drilling. Further studies may be needed to analyze whetherthese two methods are comparable in terms of the healing dynamics of bone defectscreated in humans. However, piezosurgery remains a valuable alternative to thetraditional rotating instruments thanks to its ease of use and bone cuttingselectivity. This work was supported in part by a grant from the US National Institute of Healthprovided to G.I. (National Institute of Dental and Cranifacial research, grant#DE021069) and by a grant from the Fundação de Amparo à Pesquisa doEstado de São Paulo – FAPESP (2010/07712-8, 2010/16645-2,2012/16764-7). All authors declare: no support from any comercial organization for the submitted work;no financial relationships with any organizations that might have an interest in thesubmitted work; no other relationships or activities that could appear to haveinfluenced the submitted work. JCE: Methods and experiments design, laboratory work, data collection andinterpretation, manuscript writing; EMJr: Methods and experiments designs, resultsinterpretation, supervision of the experimental work; APSF: Methods and experimentsdesign (immunohistochemistry), laboratory experiments (immunohistochemistry), resultsinterpretation, manuscript writing. FRGR: Methods design and samples processing(quantitative RT-PCR analysis), laboratory experiments (quantitative RT-PCR analysis).RAM: Methods and experiments designs, results interpretation, supervision of theexperimental work; KW: Methods design and samples processing (quantitative RT-PCRanalysis), laboratory experiments (quantitative RT-PCR analysis). GI: Conceptualizationof the experiment, supervision of the experimental work, manuscript writing. All authorsread and approved the final manuscript.